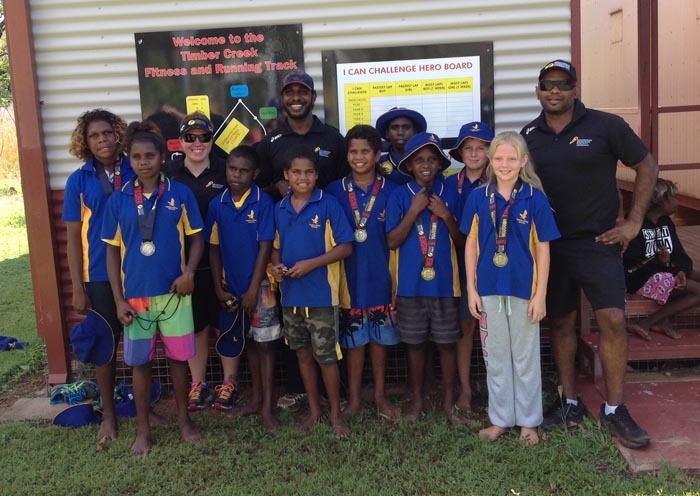 Students from a small primary school in the Victoria River Region will next term travel to Alice Springs to train with the Indigenous Marathon Foundation (IMF). In preparation for the training, Timber Creek School now boasts a fitness circuit of mushrooms, hurdles, a climbing wall and tumble roll, all funded by IMF. The fitness circuit was officially opened by Adrian Dobson-Shaw, the first Indigenous Australian to tackle the North Pole Marathon; Dwyane Jones, former Timber Creek School student and New York Marathon competitor; and Robert de Castella, former champion marathon runner and contender at four Olympic Games. Planning for the circuit began mid-2016 and since its introduction has proved invaluable in the development of student’s health and wellbeing, fitness and strength, team skills and motivation. The equipment has been enthusiastically adopted by the students and has become a source of pride in the community. The fitness circuit has been integrated into the school’s exercise program for fitness training and training for the marathon in Alice Springs in Term 2. The circuit was funded by the Indigenous Marathon Foundation and was the subject of ABC interviews with Jedda Trueman and Dwayne Jones.